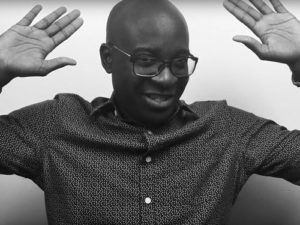 Episode 009 INFLUENCES - Khalid Rahmaan: "I wanna see a white Tracy Morgan imitator" – Let's Talk About Sets! Episode 009 INFLUENCES - Khalid Rahmaan: "I wanna see a white Tracy Morgan imitator"
Khalid Rahmaan is, in his own words, a terrible driver, a wonderful snuggler, and a Brooklyn-based standup comedian. He’s a rare Brooklyn native, free of moustache wax or unicycles. 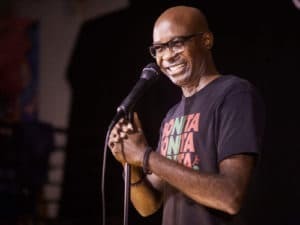 His hysterically intelligent comedy weaves together elements of politics, race, and family; it’s talking about real things in a funny way that lights his comedic fire. Oh, and he HATES clapter. This episode is dedicated to exploring comedy influences. What were they for us? How do they inform what we do today? How did our influences shape us, particularly at the very beginning? And a mammoth thanks to to our guest, Khalid Rahmaan. His fantastically funny Electric Laughs comedy show is coming back on Friday, September 1st, at Franklin Electric in Crown Heights, Brooklyn. Follow that show @electriclaughs on Facebook, Instagram and Twitter. Also, check out his funny articles on TheThings.com and head over to classicblackdude.com for well-circulated, funny article about gentrification. Special thanks to Mike Vecchione, Sarah Silverman, and David Cross. And, as always, here’s a big, wet thanks to Salt N’ Peppa for not suing us or for not yet suing us as we use an ever-so-fairly and ever-so-modified tiny smidgeon of their now basically unrecognizable song.